The Meaning of Life and the Great Philosophers reveals how great philosophers of the past sought to answer the question of the meaning of life. This edited collection includes thirty-five chapters which each focus on a major philosophical figure, from Confucius to Rorty, and that imaginatively engage with the topic from their perspective. 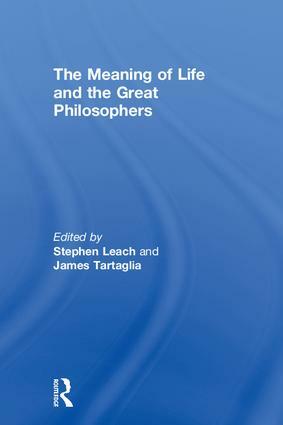 This volume also contains a Postscript on the historical origins and original significance of the phrase ‘the meaning of life’. Written by leading experts in the field, such as A.C. Grayling, Thaddeus Metz and John Cottingham, this unique and engaging book explores the relevance of the history of philosophy to contemporary debates. It will prove essential reading for students and scholars studying the history of philosophy, philosophy of religion, ethics, metaphysics or comparative philosophy. "Here is a unique collection of essays providing an overview of how major philosophers of the past approached the meaning of life. The volume is a valuable resource for both scholars and general readers." "Ranging over not merely European, but also Indian, Chinese and Muslim thought, this collection of high-quality chapters is the most comprehensive discussion of the meaning-of-life question to date." "This comprehensive volume offers a rich panoply of ways of approaching the question of meaning of life from Ancient times to the present and also from a wide range of perspectives. This book is a valuable handbook for anybody who has a genuine interest in the meaning of life as well as for students and scholars in philosophy and psychology. I believe it will be a very useful tool for classroom discussions in history of philosophy, ethics, metaphysics, comparative philosophy or philosophical counseling." Stephen Leach is Honorary Senior Fellow at Keele University, UK. He is the author of The Foundations of History: Collingwood's Analysis of Historical Explanation (2009). James Tartaglia is Professor of Metaphysical Philosophy at Keele University, UK. He is the author of Philosophy in a Meaningless Life (2016).